Ok. 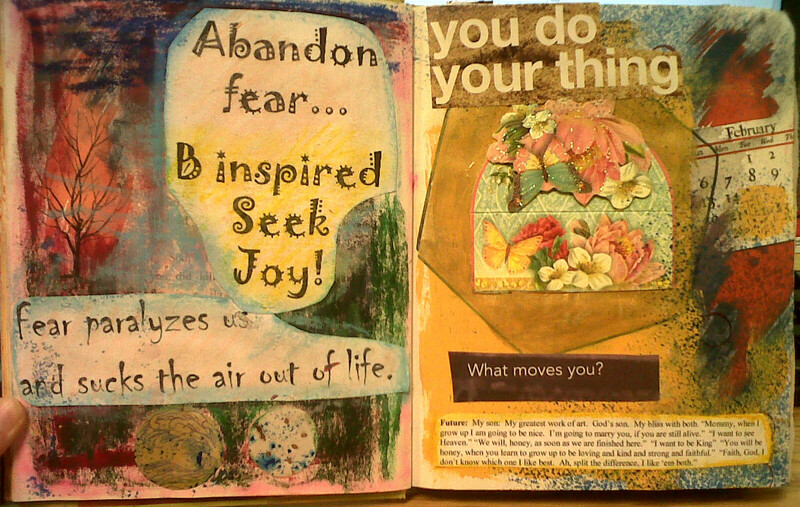 So, if I can't take an immediate workshop with Flora Bowley or Tracy Verdugo, I'm gonna fake it. I am a trained intuitive massage therapist, so I applied what I've learned over the years to painting. It isn't really that different. My hands are sensitive to changes in warmth and texture within the human body which signals tension or pain. I think that's why this type of painting is so appealing to me. I like the flowing movements that leave trails of color on the canvas the way my hands have left trails of relief on the canvas of the body. I have always felt like the Creator flowed through me as I massage, pouring out His Healing Power through me, I just had to remove my self or my ego and allow The Flow. 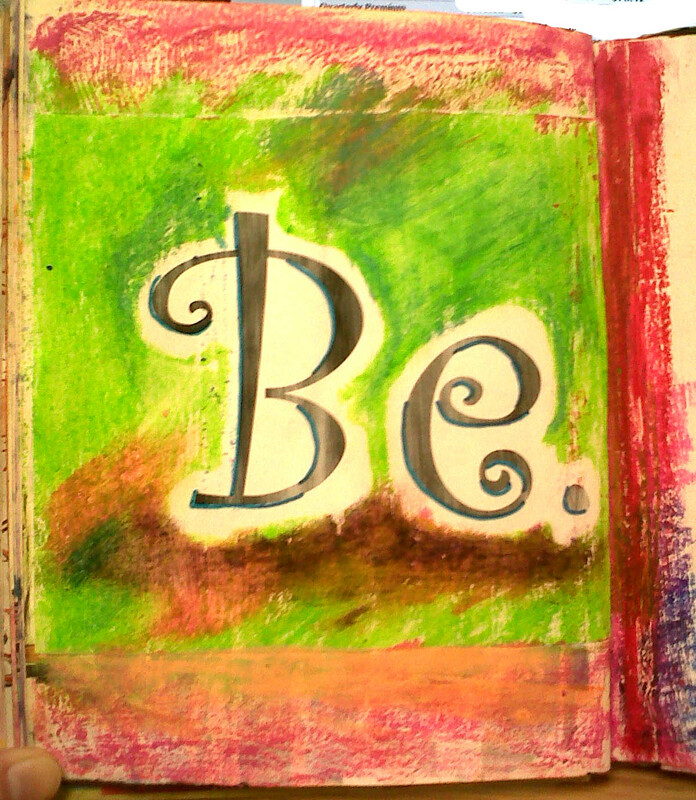 So, the other night, I tried that with painting. I liked the results. I don't feel like I'm anywhere near finished, and there is an art show in town this weekend where I really wanted to display some paintings... it may happen, it may not, but I'm painting now, and that's everything. 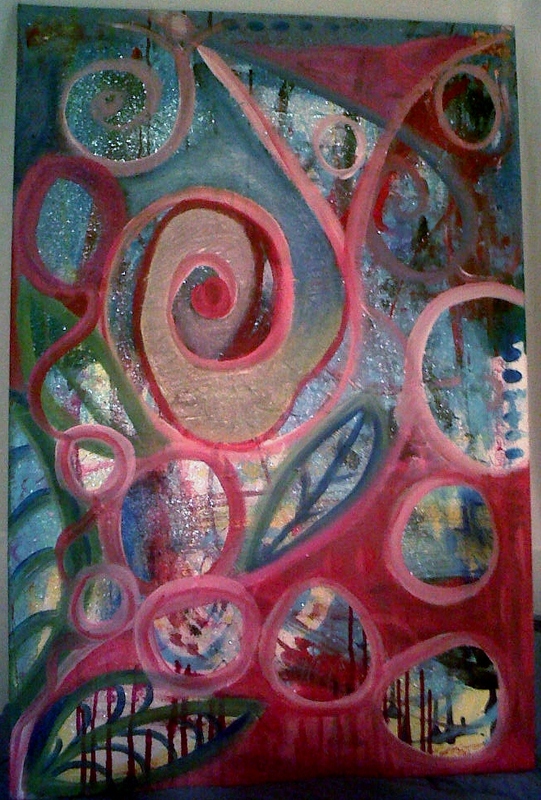 If I can figure out how, again, I'll post a pic of the painting in process here. Please feel free to leave comments, and I welcome constructive criticism, hm... you know, I really don't. I think I'd only like to hear praise, lol! (Grin). LKTV67 - My Son. My Inspiration. Haven't posted in a while. Too much going on with The Holidays: Thanksgiving... well, I know, not much of an excuse. I guess I don't have the habit and I'm plagued with doubt. Ever have that happen? Well, I just learned, again, an important lesson from my son. He has his own youtube channel: LKTV67, and he is always making videos and uploading, and getting ideas. http://www.youtube.com/user/LKtv67?feature=chclk#p/u/0/CR3B18zrzBQ He is following his bliss! He does it because he enjoys it! Imagine that. Now, I think I'll get on with doing what I enjoy... and it isn't housework! Let's go sling some paint! Thanks! 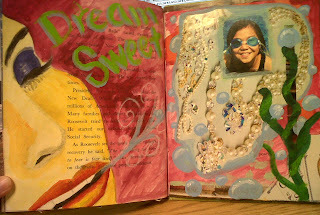 These are pics of the pages of my first art journal, which is a children's book I've altered. 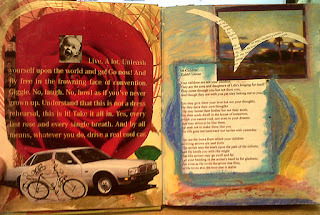 This is just the initial phase... a beginning layer of quotes, collaged pics, some paint... they have a long way to go... down this road of Life. I was in such a rush to get these up and running on the site... after all, what good is a blog about art with no art. My pics leave a lot to be desired, and my cropping and all that's going to improve... it's all about process... journey, not destination! All of the words in my art journal are very important to me. On the right is a part of "The Prophet" by Kahlil Gibran. One of my very favorite peeps in the world, my 7th grade literature teacher, Mrs. Mildred Greear gave me a beautiful gift of this book way back then. For many, many years, one of my most prized possessions, and the memory is still one of dearest. Wonderful book! "We" are all in such a hurry, checking off items on our to do list... 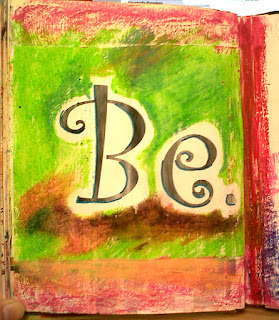 I have to take time to just BE! By the time I post the "new, revised" editions, I promise the pics will be better quality! This page has an exercise that my high school art teacher, Mr. Bill Amos, gave a bunch of his grown up students on facebook! Thank you, Bill, you are the bestest! Well, must get off to my second "day" job. I am most grateful you joined me here. Please leave comments. I would love to hear from you! And, feel free to post links to your blogs and websites. All are welcome here! I am grateful for the technology that allows us to connect with kindred souls and spirits. This blog is all about healing our hearts. 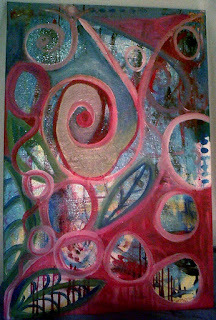 Two beautiful women: Flora Bowley (www.florasbowley.com) and Tracy Verdugo (http://artoftracyverdugo.blogspot.com) have posted pics of their artwork on their sites that have stirred my deepest innermost desires to "sling" paint! The pic shows Flora at one of her workshops. As I looked at photos of artists with paint on their hands, I remembered a scene from one of my favorite movies, "Benny and Joon." If you've seen the movie, you already know the scene I'm thinking of, and if you haven't, you need to! Up close and personal shots show Joon expressing her memories of the loss of her parents, her abandonment, by moving the paint around on the canvas with her hands, massaging her aching heart on canvas. It's like someone is doing heart surgery, prodding and probing my sensitive spots... and as I looked at the photos, I remembered. The Beginning. I had bought an oil-painting kit at a bookstore in a mall. I carried that kit with me as I moved from location to location, from one part of the country to another, in search of my bliss, but I never opened the tubes. Art was something others created. When I finally was abled to face my fears and open the tubes, the paint had dried the caps on and I had to use pliers! The company where I worked relocated to the other coast (the one I had just left) and I took advantage of that moment in time to go down a different path. A chance encounter with a professional housepainter at a paint store (I was going to paint a metal bedframe that belonged to my grandmother) afforded me a chance to apprentice as a painter. He taught me how to paint walls. I learned sponge painting and faux marble when the craze was peaking. I had a few clients (I can make up flyers and market myself well)... but where I am going with this... my painting encounter with my own bathroom... 1/4 bath really. I poured puddles of paint on a plastic drop cloth: beautiful hues of greys, blues, deep lavenders, and dipped my roller in... I had a blast rolling that little bathroom with all those gorgeous colors! Then, the coup de grace was when I sponged on top of that with oranges, yellows and reds. I topped it off by hanging a poster of a Monet, waterlilies or something. I was so thrilled with my creation. Unfortunately, my significant other of the time wasn't... shoulda been a red flag. I allowed myself to be derailed instead of following my bliss! So, here I am, getting another chance. Stay tuned for pics of my hands in paint! Please feel free to leave comments about your own journey to paint! My brother-in-law seems to have come up with a new anacronym (I almost wrote anachronism, and there, folks, is an excellent example of where my brain is going) for the way our minds have begun to work (shall I stop before I say the dreaded words "in our old age? "): "CRS" or can't remember squat, only I think he put a different word in for the "S." Sometimes I think my worst nightmare is that I will remember only the things about my life that I don't want to! Or that just as I begin to figure out Life, I will forget what I figured out. Anthony deMello was a Jesuit priest, author, speaker, and if you haven't read "Awareness," you should think about it (I'm trying to quit saying "You SHOULD"). It is a collection of his writings and talks. He is amazing. In "Good, Bad or Lucky" (p. 30), he passes on this wisdom from someone else, "The lovely thing about Jesus was that he was so at home with sinners, because he understood that he wasn't one bit better than they were." He went on to say that "We differ from others--- from criminals, for example-- only in what we do or don't do, not in what we are. The only difference between Jesus and those others was that he was awake and they weren't." "The Pharisee wasn't an evil man, he was a stupid man." That's us, stupid, thinking we are better than others... we're just lucky, maybe, to be awake or aware, or becoming a little more so that way every day... maybe a little more like Jesus? See, this is good stuff, and I don't want to forget it. I just want to forget all my stupid mistakes, and hope everyone else concerned does, too. When I need to remember something important, maybe someone will direct me back to my blog. 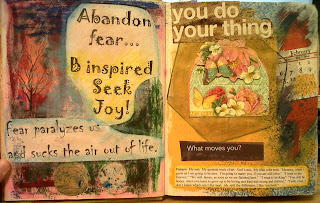 From deMello: "I dare not stop to think, because if I did, I wouldn't know how to get started again." 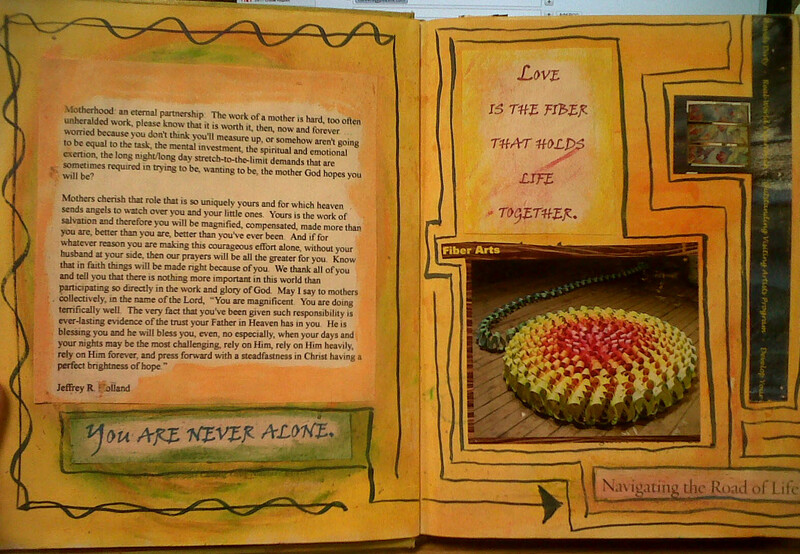 In my first post, I alluded to Real Love and how it had changed my life. Greg (Dr. Greg Baer, author) says that "It's ALWAYS about Real Love." And, that's been my experience, too. Whenever I am angry, sad, or scared, I'm not feeling loved. I was introduced to Greg by someone from my church. I was confiding my concerns over the possibilities of the failure of my marriage. He recommended that I call Greg. I was already seeing a counselor, but this guy insisted, plus, Greg was located in my home town, just an hour's drive away. The first time I spoke with him on the phone, giving him a cliff notes version of my situation, he said, "You only have one problem." Well, of course, I replied, "Ok, what's that?" He said, "You have never really been loved." It was one of those life-changing moments. I had been telling all those around me all my life that they didn't really love me, and here was this guy telling me I was right! One would think that would be sad, but it wasn't. It was validating! One of the worst things that is done to kids is telling them "I love you" instead of "I'm really sucking at being a parent." Only recently have I begun to get specific with my own offspring. "Let's tell the truth. No need for apologies." Saying "I love you" is one way we say many things: "I screwed up, please don't be angry... do you still love me?" So, when we screw up, which is often, we say something like "Wow. I just got angry again, and, of course, that's wrong." Because if our goal is to be happy... angry (or sad, or scared) is always wrong! I won't go much further into this today, other than to urge you to go to the website: www.reallove.com and check out everything that is available there. Greg (and his wife, Donna) aren't trying to get rich or become the next self-improvement gurus. They have discovered the formula for happiness: loved, loving, responsible, and their efforts fit right in there. Get the love you need by getting on the (FREE) forum located on the website, reading the books, getting on (FREE) conference calls, making connections with people who have agreed to love you the best they can, and to tell the truth about it if they can't. It's quite refreshing. Even FREEing. Happiness making. You can never have too many Real Friends. I once studied with a spiritual woman, and she said that if someone is claiming to have the truth and selling it, it ain't the truth. Greg makes so much available... for free!